Those who have read this blog for awhile (or even just a short while) would know Marc by Marc Jacobs is one of my very favourite brands. I can’t stop gushing over how wearable and chic Marc clothes are, especially the SS06 collection. Apart from the clothes, I love the accessories too. Unfortunately, Marc seems to have decided to go more mass market than before and have started to make MJ logo bags! (Since the SS06 collection I think. )For those of you who don’t know, MJ logo is simply an alternate name to the oh-so-over-done monograms. I thought the Marc brand was beyond monograms –turns out I was wrong. The main bag focus from the SS06 collection: the hobos. The white and brown one would have looked so pretty without the MJ logos! Cute satchels for a casual summer day, but the logos have def made them less chic. Also, monogram just looks cheap on non-leather bags. Even the clutches and small handbags come in logos. These tiny logo bags look even cheaper than the big logo bags. Unfortunately, the logo design carries on into the FW06 collection. I LOVE this Marissa bag –it’s SO stylish and practical and versatile and… I think if I stare at it long enough, I can get pass the terrible Marc Jacobs logos. huge mj fan right here and i totally agree with you on all aspects..i keep thinking maybe there will be more coming out which are less heinously labeled? speaking of that..the lv cabas bag from summer with less logos, seems they're continuing it into the fall with the Stamped PM and GM in suede..i want the grey! any idea when they'll be released to stores/approx prices? I was just commenting on the Fall Ad that I saw on my Lucky magazine... MJ did horrible with these monogramed bags. I just looks cheap. I completely agree. I was looking for a bag for school and looked over the new Marc by Marc Jacob's ones and was completely disappointed because they were all logo'd to death. Sigh. How he designed it makes it look so incredibly cheap as well. I like the style of the Marissa one too and thought well "the logo's are that noticable and maybe i can get over it" - but then was like NAH. I agree, the logos on the bag take away from the style and design of the actual bag. 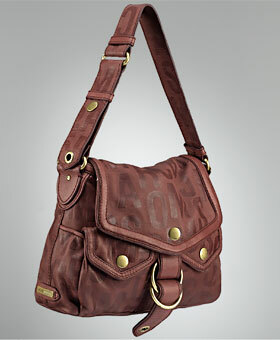 The Marissa bag, since its logos are less noticable is the only one that doesn't look as cheap. NOOOO!!!! Monograms already destroyed LV, not MJ too!!!! They looks so tacky. What are they going to monogram next, their shoes? actually, i shouldn't give them ideas! I also hate the logos. One thing that I've loved about Marc is that he didn't blast his name all over everything. I just don't like the logo look for any designer (from LV to Coach). On another note, I am still dreaming of the Miss Marc Katie Bag... Sigh. i must agree with you, i adore the last bag you posted. marc jacobs is one of my favourites as well, you cant go wrong with a random choice of anything he designs. The first hobo bags are totally destroyed by the presence of the logo! Some companies carry logoes off well, such as Gucci. Not MJ though. Oh, I hate the monograms too. I've never especially liked Marc Jacobs, and those bags are really quite tacky. Not looking good. I thought Marc would know better..
WAUU! Excellent bags! But my favorite is Spy of Fendi ! Kisses ! these mj logo bags are gross. i love mj, so i'm really disappointed. they look cheezy and cheap. I hate monograms on any brand of any bag, perhaps save the dior saddle bag or the original LV brown leather monogramming. Even then though, doesn't it look simply tacky? I always feel as if people are trying to show off wealth, but in a rather unclassy way. Talk about nouveau riche. I have a Danielle bag in chocolate, which has the logos, and it is beautiful...despite being "branded." I think the bags that are blue and mustard are gross looking, but the beige and chocolate bags are less abrasive. IMO. And...I totally love my Danielle bag. Its amazing. The Breitling Bentley Air-wolf Raven watch is one of the new additions to the famous Breitling Avenger Raven line. The one is Montbrillant Datora Sky-racer raven watch. This article is going to introduce the Superocean air-wolf as it powered by the Super Quartz caliber 78 movement which also serves the highly famous Aerospace watches. This coolest COSC certified Chronometer quartz movement boasts the admirable accuracy to about five seconds a year. If you're burdened with Christian Louboutin Sale but none of the right type then this will never ever happen when you have the Christian Louboutin Pumps at your feet. A pair that you'll be able to get from the great collection of footwear is the Christian Louboutin Boots Brown. This is most likely the first time that you see these types of three surprisingly different grains of leather being employed together and making such a great design. The right and good-looking mixture of black suede on the metallic Christian Louboutin Sandals leather adds the best splashes of silver and black. It can be said the superb experience in design and color composition of Ed Hardy Clothes , make simple T-Shirt has become enjoyable, and hardy shirt products are various, and it even launch energy drink, people look forward to changing hardy shirts make its future more bright. hardy shirts has stores in the Americas, Europe, Asia and the Middle East. The brand value of Ed Hardy estimated close to 10 million dollars in 2009.